Winter storm Stella isn’t necessarily an indication of climate change. How Normal Is a March Snowstorm? Winter Storm Stella is coming. Can we blame climate change? 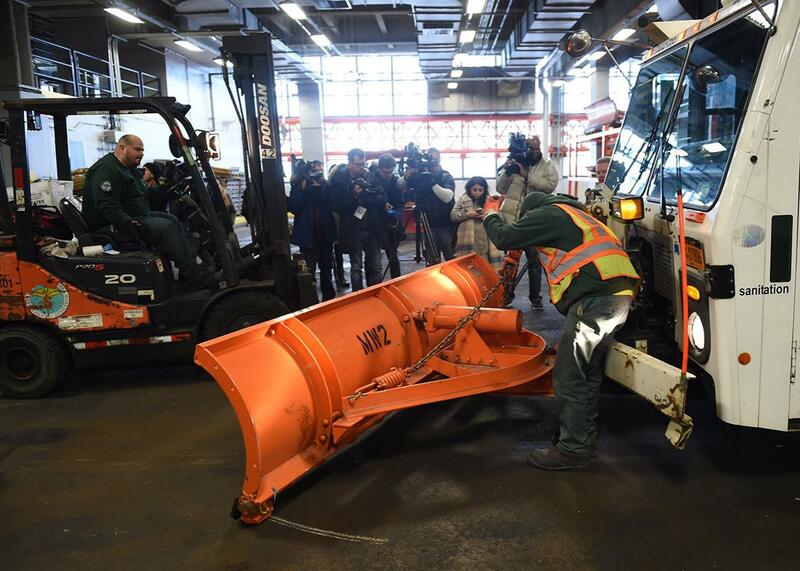 A New York City Department of Sanitation garbage truck is fitted with a snow plow in the West Side depot on Monday. Many on the East Coast are hunkering down for Winter Storm Stella. The National Weather Service has issued a blizzard warning for much of the Northeast, covering almost 20 million people, and is predicting a foot or more of snow in swaths of the region. Schools in New York, Philadelphia, and Boston are already closed. New York Gov. Andrew Cuomo has declared a state of emergency. Flights scheduled for Tuesday have been grounded. There will likely be power outages. Public transportation will be a nightmare in places where it isn’t entirely shut down. People are annoyed, considering 2017’s initial promise of an early spring. Daffodils have been blooming, and early cherry blossoms in D.C. have the National Cherry Blossom festival scheduled for Wednesday. So, what’s happening? Isn’t this kind of extreme, potentially record-breaking snowstorm weird, particularly when considering that its right at the beginning of what was looking like a gloriously warm (but ominously early) spring? Is it something we should worry about? Could this be an indication of climate change? It’s entirely possible, but it’s extremely difficult to ascribe causation to weather events, particularly weather events that can occur anyway. Better to say that certain situations exacerbated by climate change make certain weather events more likely. Is that the case with storms like Stella? Does climate change make such storms more likely? Joe Casola, deputy director of the Climate Impacts Group at the University of Washington, said there’s a chance climate change influenced Stella by pushing around the jet streams that steer the storm’s path, an important factor in determining how much snow the storm picks up. But this hasn’t been studied extensively—Casola called it “an exciting new area of research.” Scientists know that global warming makes precipitation heavier, as it means more evaporation. But that phenomenon is more relevant to rain than snow, and Casola says it shouldn’t result in more than a 20- to 30-percent increase, which wouldn’t explain the difference between a dusting of snow and a foot of it. This effect can be seen more clearly when the Great Lakes don’t freeze over and storms drop more snow in the surrounding regions. But Winter Storm Stella, a nor’easter, is not a product of this lake effect. “It’s hard to make a climate change case from nor’easter storms,” Casola says. Those numbers, on their own, look alarming. But it’s extremely hard to discern causation from a trend line that includes just eight data points, Casola said. And he added that extremely rare events can’t really be used to look at trends: Numbers that small could point to a trend, but they could also just be a product of chance. If you want to look at extreme weather events to see climate change in action, Casola says, you should look at heat waves and heavy rainfall. For those events, there’s plenty of data out there, and researchers have a firm grasp of the mechanics at play that worsen with a warming planet. Because, yes, climate change is happening, and yes, it will affect the weather we have all over the globe. But stating that individual weather events are definitely the result of climate change is dicey business. So to return to the question: Is this storm a product of climate change? Probably not. But maybe! We really can’t know for sure. It’s better to resist conflating the dramatic and very real effects of climate change we know about with extreme events we can’t be sure about. Doing so could even be provide dangerous ammunition for climate change deniers. Either way, if you’re in Stella’s path, the best course of action on Tuesday is to stay inside.